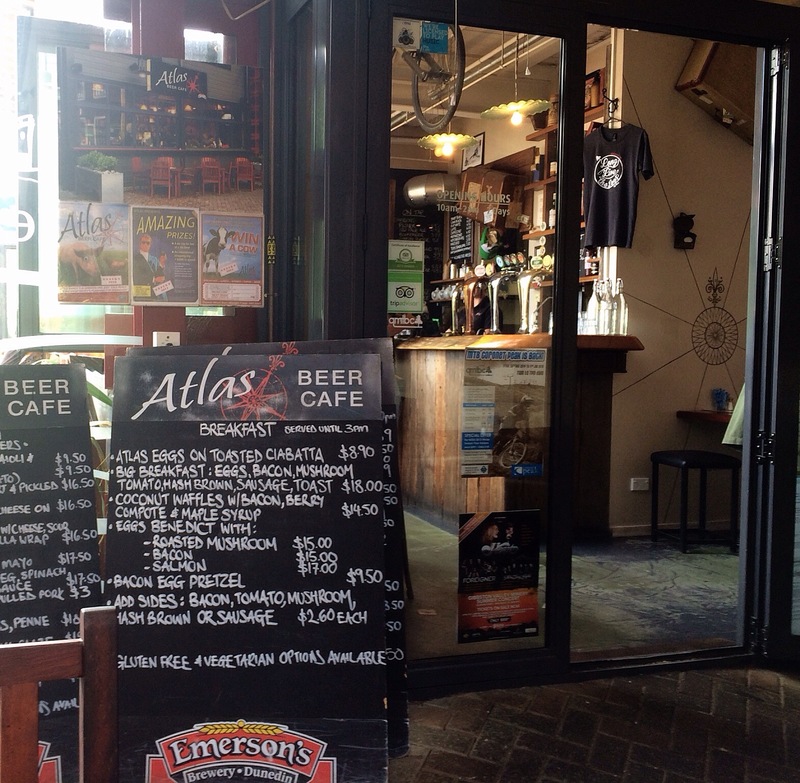 The home of Boutique Craft Beer, is the Atlas Beer Cafe, hidden at the back of the Steamer Wharf in Queenstown. Boutique beers are their specialty, along with enticing menu choices throughout the day. 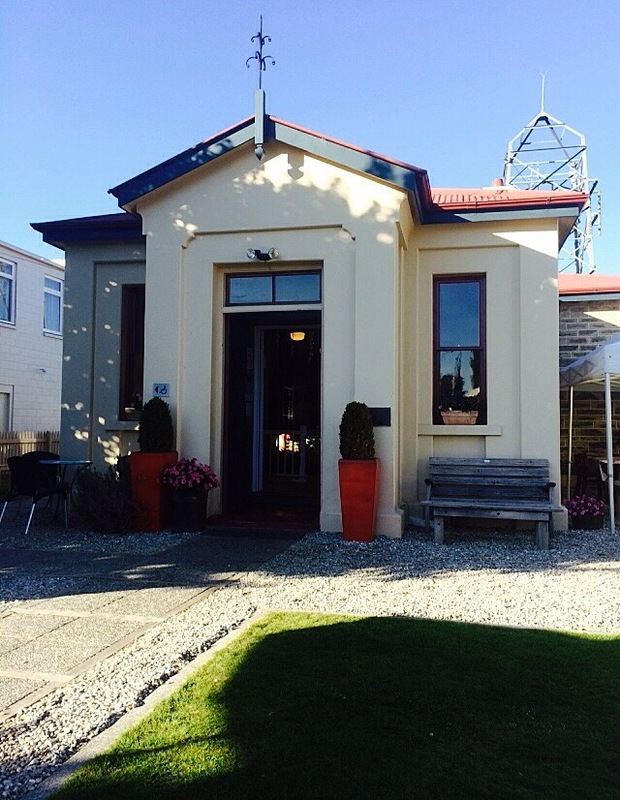 The inside is small with some seating, including bar stools facing out over the wharf towards Lake Wakitipu. We chose this venue for a light lunch, late December. The day being a rather dreary day with a biting wind, we were drawn towards sitting inside the covered mall, near the entrance to the cafe. I was fascinated to see the restaurant opposite, have blanket wraps on each chair for their, customers. Not only were these outside, but also inside the covered mall area. Remember this was in summer! Choosing and paying for meals plus drinks at the bar, we enjoyed a quiet drink while waiting for the meal to arrive . I must admit we did have a bit of a giggle, as we watched the chef come out of his kitchen to read the chalk menu board. 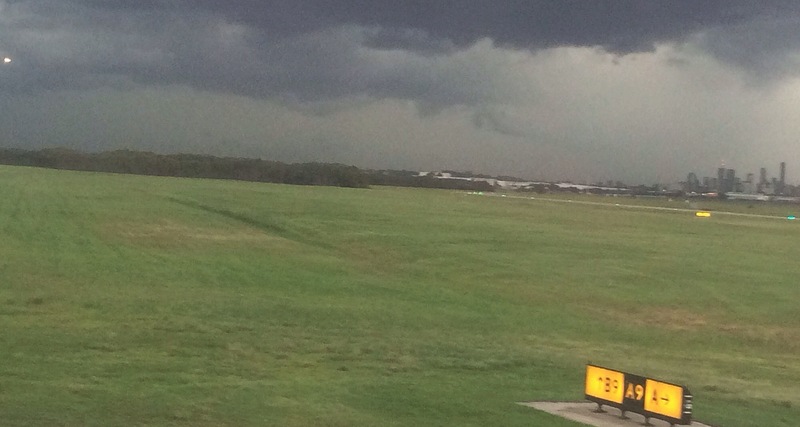 Not that this bothered us, it simply tickled our fancy to see this unfold. We both chose the same fish dish today. Presented with a crunchy side salad and chunky chips, this was a delicious choice. 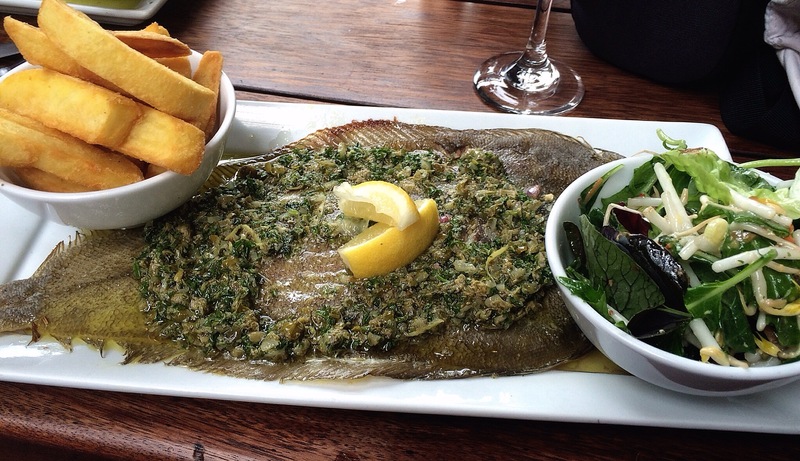 The whole baked sole which was beautifully soft, topped with a tasty garlic and caper butter mix, fell away easily from the bones. 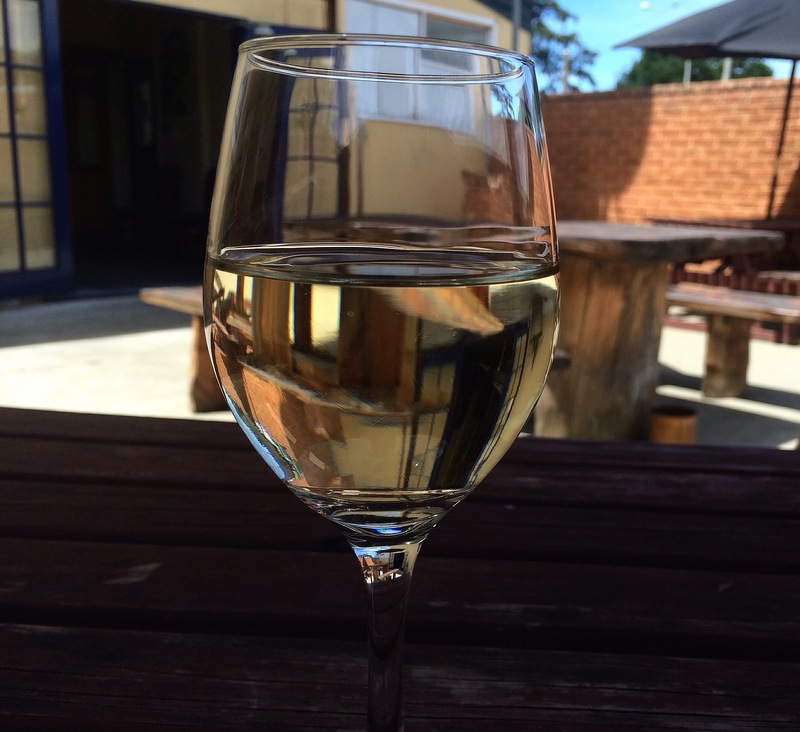 My choice of a glass of local Chardonnay at only $8, completed the meal. If you enjoy watching the world go by, this is a great place to sit and observe. Drop by next time you’re in the Steamer Wharf area. I did notice while at the bar, a customer was offered a taste of a boutique beer before he purchased, after enquiring what it tasted like. At least that way you won’t end up with a glass of something you don’t like! 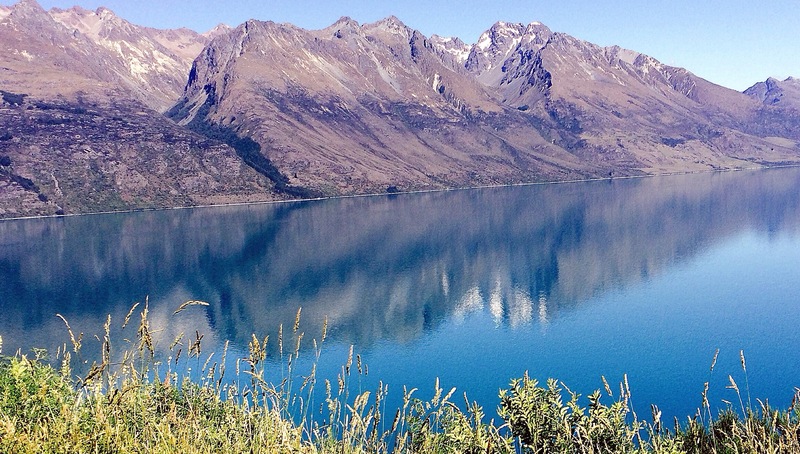 Drive down the arm on the West Coast Side of Lake Wakitipu, to arrive at Glenorchy. The road is narrow and winding in places, however the 40 minute or so drive from Queenstown, is intercepted with some of the most stunning landscapes you have ever seen. We enjoyed a fabulously clear late December day for our drive through from Queenstown, resulting in some wonderful photo opportunities. There really is no rush when you have opportunity to view this stunning landscape from many different angles throughout the drive. By the time we arrived, it was lunchtime. 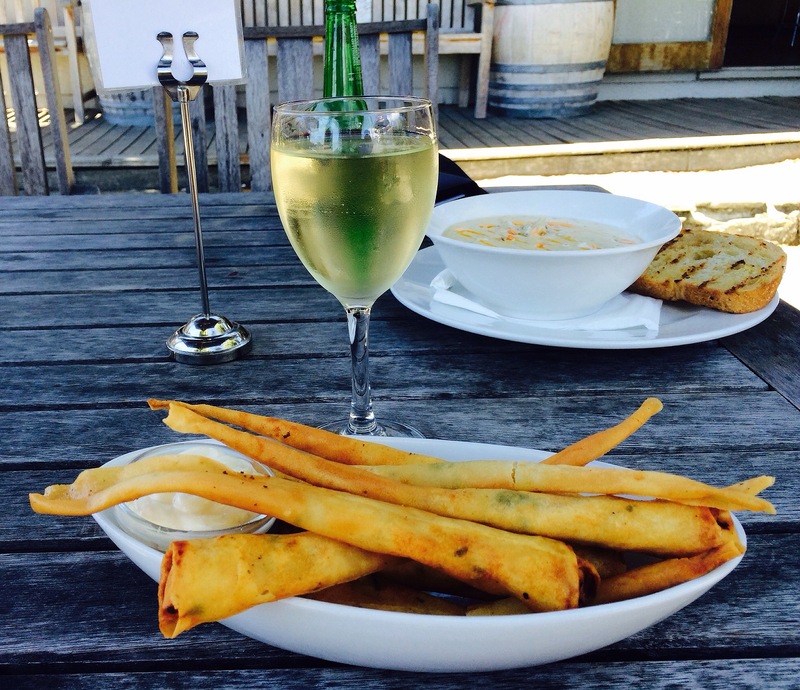 There were a few lunch choices in this small township, from which we chose the Invincible Bar at the Glenorchy Hotel, with rough hewen outdoor seating, adding to the country feel, whilst looking towards the snow capped mountains. Lunch was ordered and paid for at the counter, with staff delivering food to the table, after a short wait. 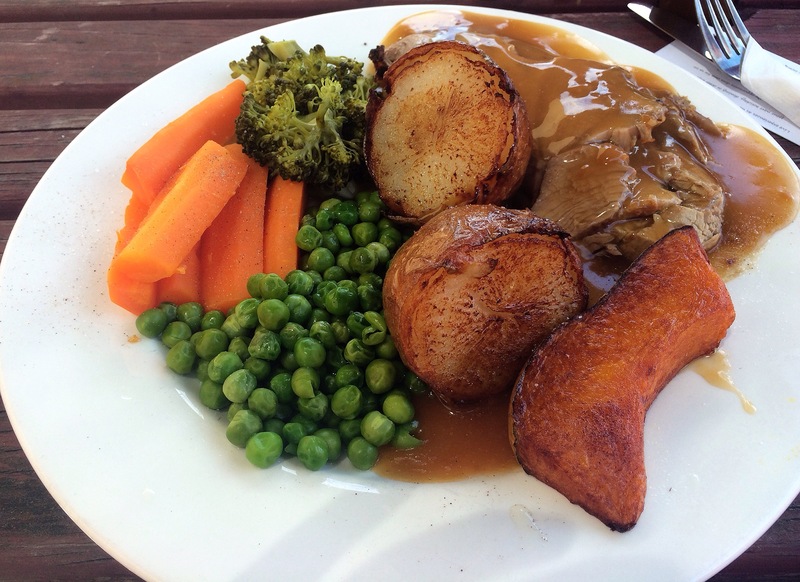 All the staff were friendly, and we were lucky to have our lunch delivered just prior to a bus load arriving. I chose the prawn twists with a side of aoli, instead of the usual sweet chilli sauce. The prawns were large, melt in the mouth varieties, making for a delicious light lunch. 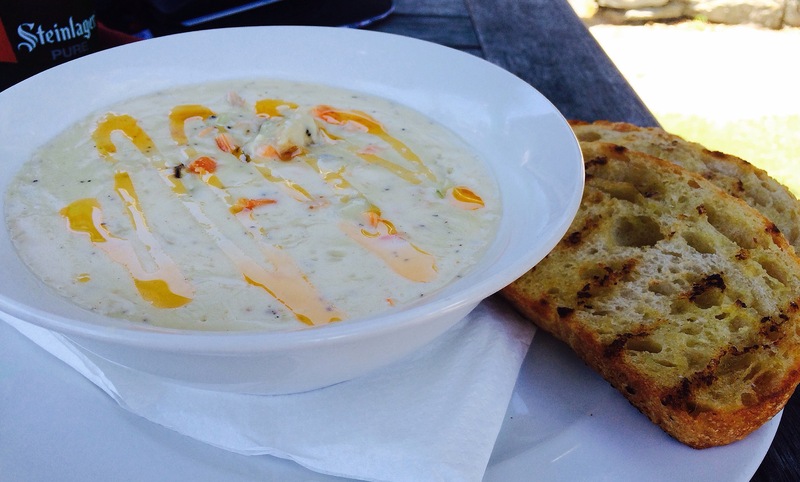 Hubby’s choice of the big seafood chowder was a hit. Packed with seafood, accompanied by a crusty bread, he really enjoyed this tasty treat. Once you’ve made the drive into Glenorchy, you most likely will be looking for somewhere to sit and relax for a while. Under the umbrella adorning one of the tables, partaking of a quiet lunch, you may find it difficult to leave. Be sure to check out the lakefront area, before you leave, you won’t be disappointed! Overlooked by the famous Alexandra clock, with the Shaky bridge, directly across the road, sits the Shaky Bridge Vineyard Cafe. 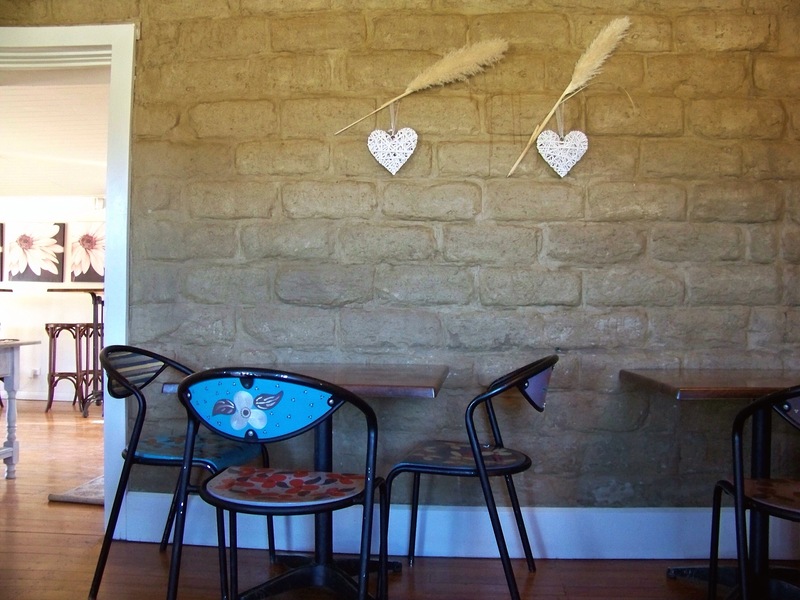 Built of mud brick, with inside or outdoor seating, the cafe had an appealing menu. After ordering at the counter, we chose an indoor table as the breeze had a slight bone chilling cut through it on this particular morning. Quirky furniture marries well with the simple art pieces adorning the walls. All tasteful, with nothing overdone. There are a couple of rooms inside to choose from, the one we picked had a large fireplace on the end wall. 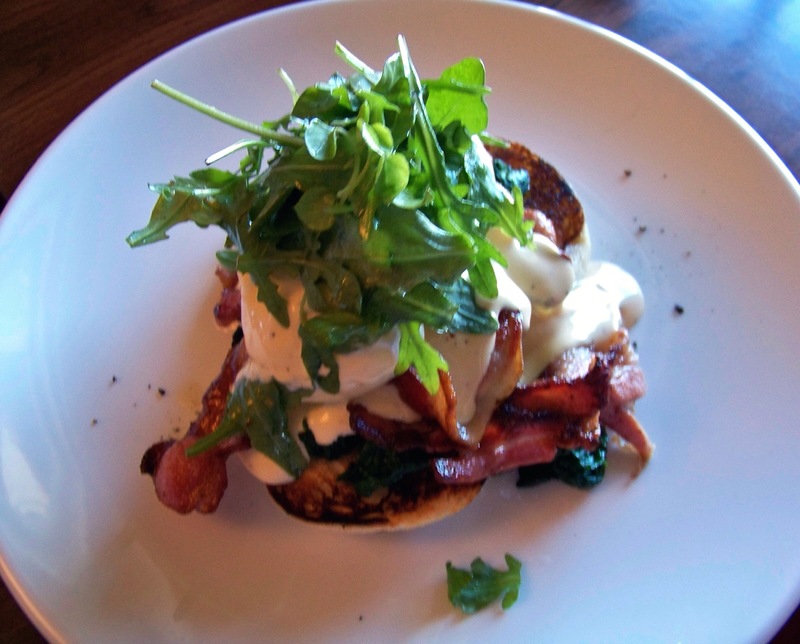 There was certainly nothing wrong with the food, with hubby enjoying his Eggs Benedict, pictured below. Apparently it was delicious and teamed well with his iced coffee. On this occasion I wasn’t hungry, being more than happy to enjoy a delicious green tea. Another coffee at the table, mocha chino, was apparently ok but nothing spectacular. Overall though, this was an enjoyable place to enjoy a quiet breakfast. You may feel inclined to walk off your meal with a climb up to the clock, as a few people seemed to be enjoying. Or, perhaps if you take a stroll first, over the shaky bridge or up the hill, you will work up an appetite for the delicious meal to follow. There is a lookout up the hill too, you can take a drive or wander up here for some spectacular views across Alexandra. Enjoy the views, a walk, then kick back here to wile away an afternoon. Sounds wonderful! 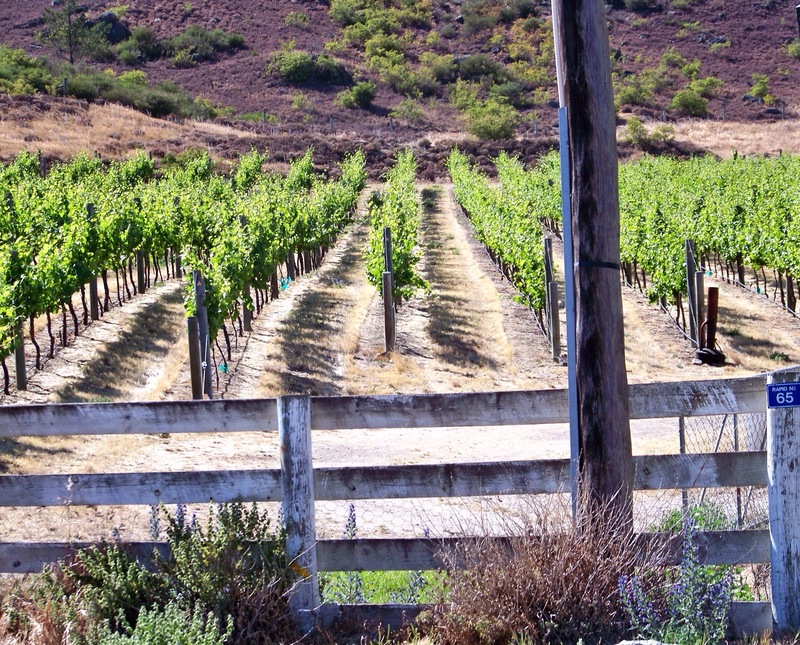 The vineyard attached, includes one of the oldest Pinot Noir vineyards in the area. Red wine, teamed with something tempting from the cafe…seems to be setting the scene for a relaxing afternoon! Nestled in between buildings, lies the Courthouse Cafe, originally built as a Courthouse in 1876. This building and setting, has been brought back to life, before reopening as the Courthouse Cafe & Bar, in. Alexandra. 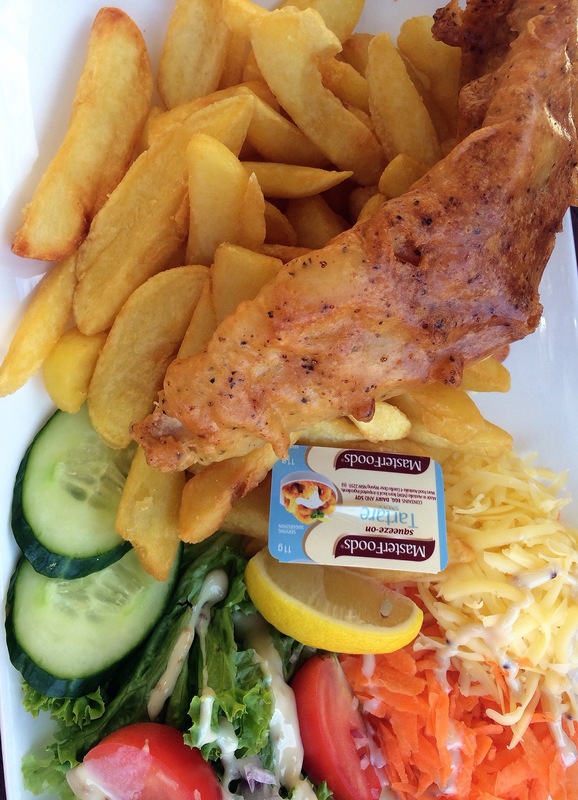 Here you are judge & jury, with a fabulous selection of fresh foods to choose from. 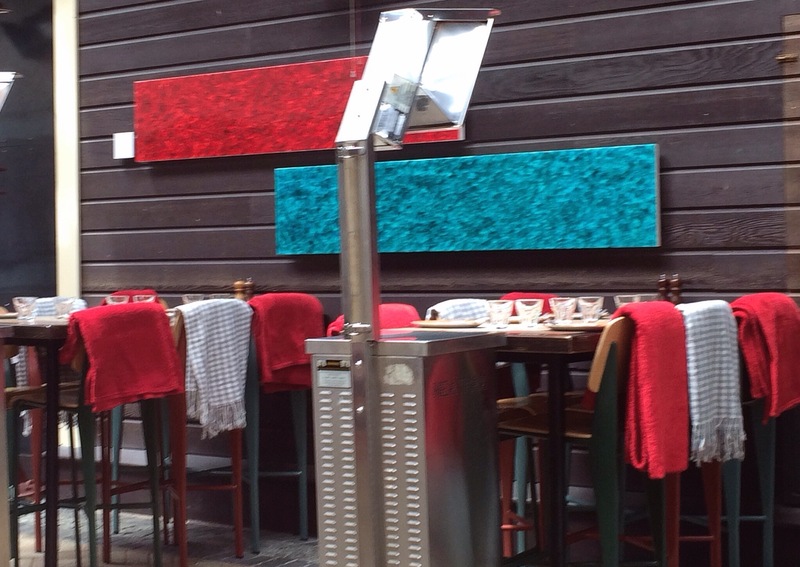 Indoor or outdoor seating is available, with umbrellas shading the outside tables. Plenty of room between table settings here. 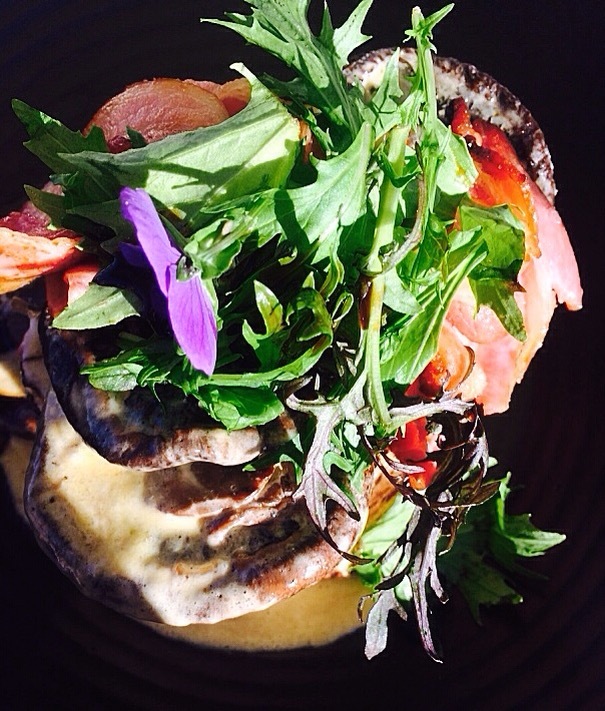 Each meal has been tastefully designed, with the fresh flower theme continuing in the meal design. Eggs with bacon above were fresh and tasty. Certainly no complaints, the meals were great and the service was pleasant, with very little wait time. 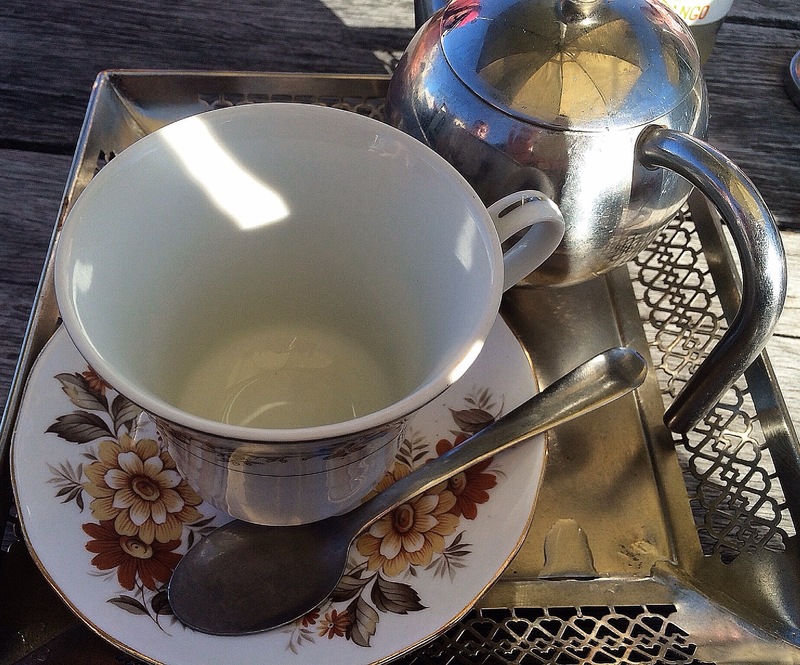 Tea was presented with the cup and teapot sitting proudly, side by side, on their own tray.. 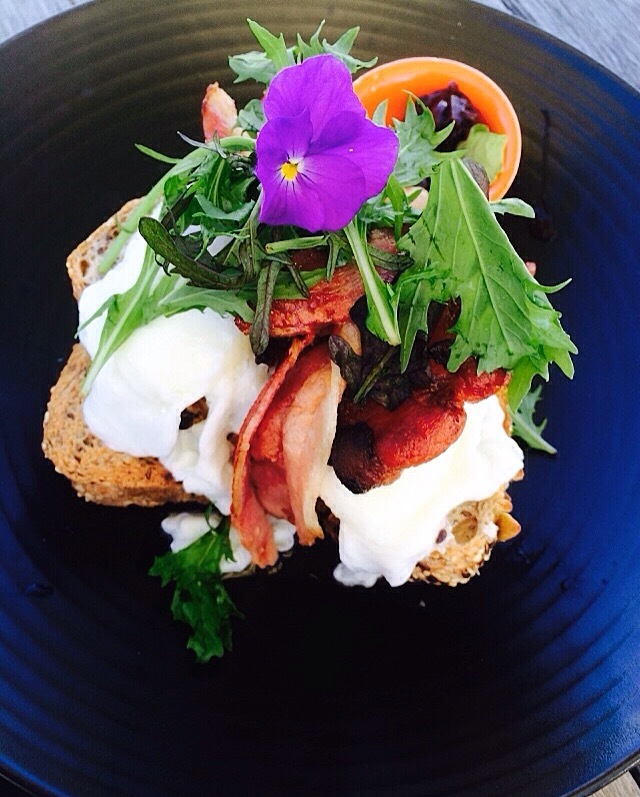 I trialled the field mushrooms above. Delicious. All of these meals were stacked high, packed with plenty of fresh produce, very filling. A lot of thought has been put into the presentation of the food, drink and surroundings here. You may want to judge this one for yourself 👍. 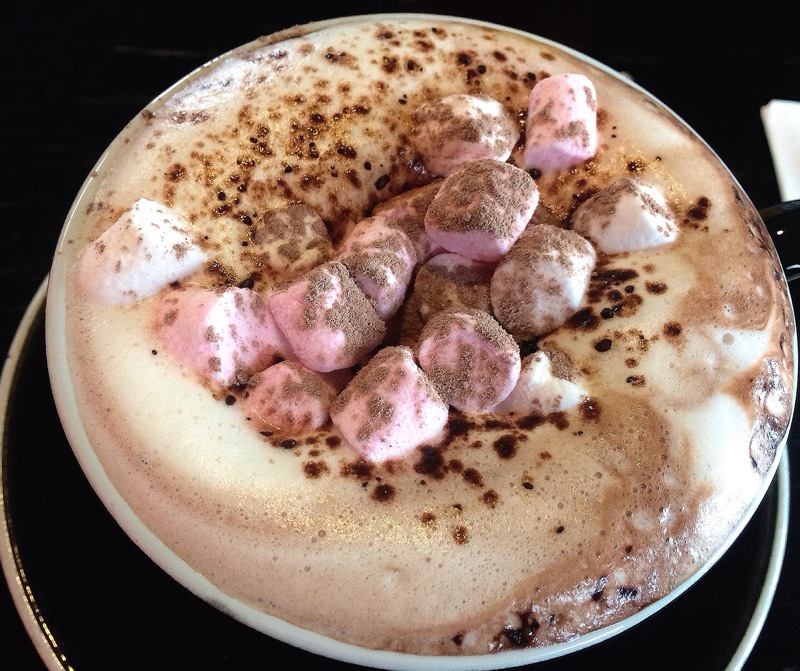 Now that is a hot chocolate! After a big night the night before, followed by a decent sleep, we found our way to Jagz of Village Green, for a Sunday Brunch on a rather cold Southland morning. First impressions are really good with plenty of seating areas, reasonably spaced tables set amongst clean inviting surroundings. 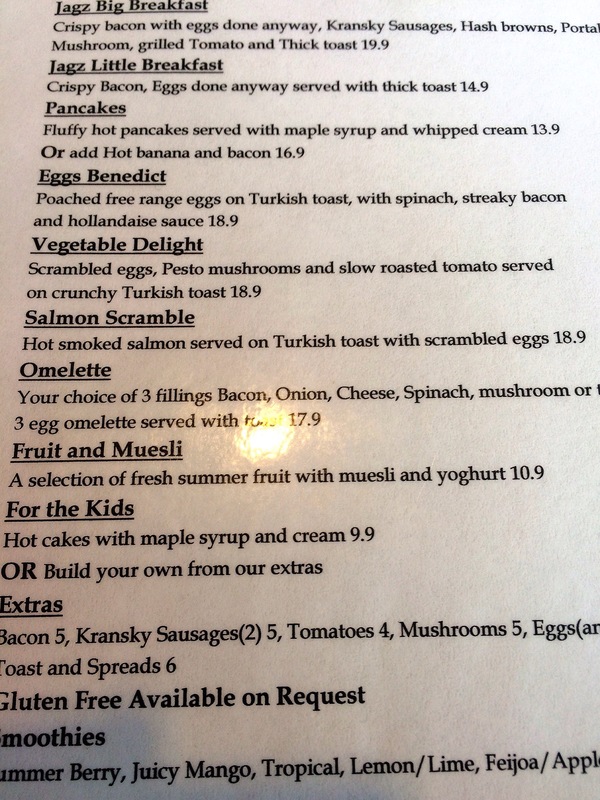 The breakfast menu looked intriguing. Service was friendly, without too much of a wait. 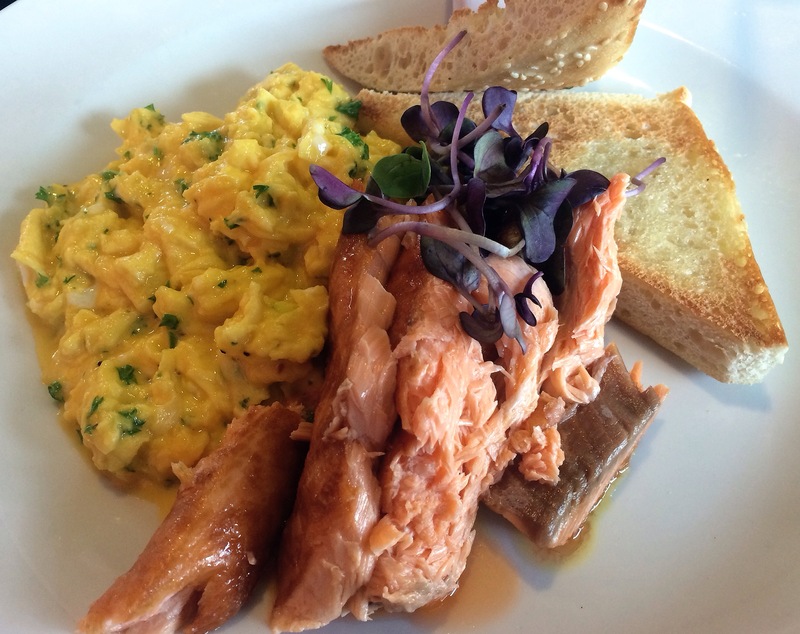 I chose the hot smoked salmon, which sounded appealing. Very good choice on my part, this was a delicious, warming breakfast. The beautifully soft salmon fell apart easily. All the meals were fresh, rather tasty and reasonably priced. 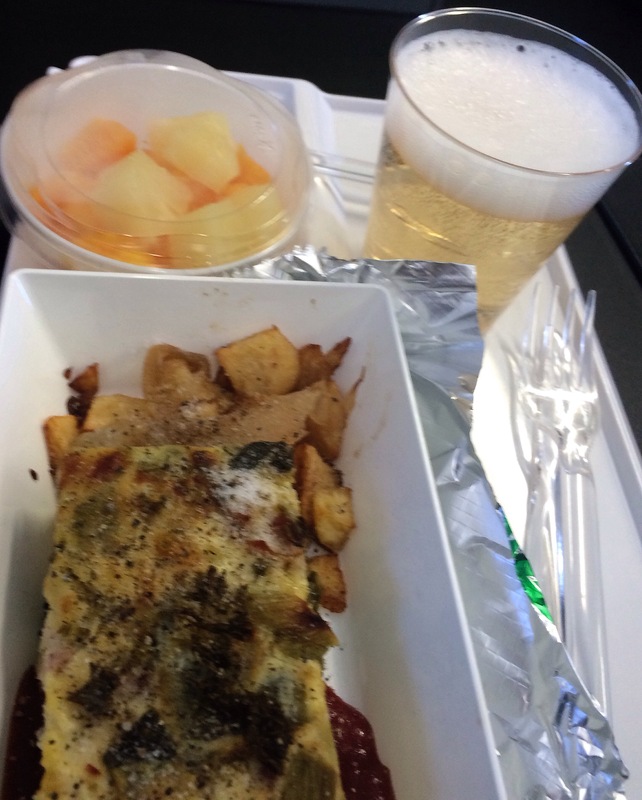 I must admit to being a little envious of a table in the corner, enjoying a wine with brunch. Now that would have been a fantastic idea, if one had not overindulged, just slightly, the night prior 😄. 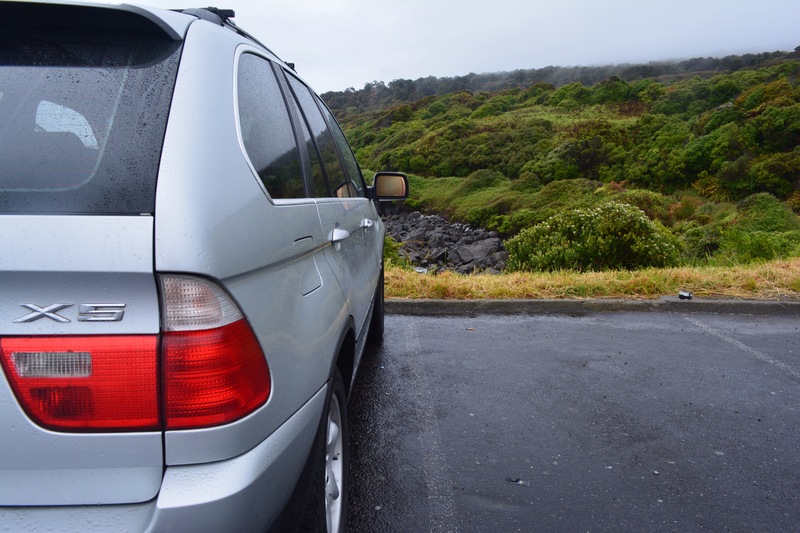 If you’re heading to NZ and looking to hire a car, this company offered the best deal for us, that I could find, after a lot of research on my part! Based in Christchurch and Auckland, with a drop off/pick up depot now added in Queenstown, they offered the opportunity to drive a nice comfortable vehicle, along the lines of Mercedes or BMW. Not only this, their prices were very reasonable. The only hitch they advertised, the vehicles would be older, not new style. Booking early in the year for a December pick up, we checked the website for the biggest engine capacity available. With a reasonable length road trip, over varied roads, plus being big car owners, we wanted something to suit our taste. To be able to secure a V8 BMW X5 for a similar price as other companies wanted for Falcons and Commodores, was a bonus for us. Not only were Drive Something Nice easy to deal with, from the very first email enquiry, their service to drop off and pick up the vehicle was excellent. The BMW above was delivered to our airport hotel at 9.30am in the morning as agreed. Paperwork was easily completed, and after a checkoff of the vehicles current, bumps, and a quick run down on the vehicle, we were packed and headed on the road. No complaints from us, this vehicle was tidy, well maintained and a comfortable ride. Yes some things were showing a bit of wear and tear, however, nothing which affected the way the vehicle drove or the comfort within. 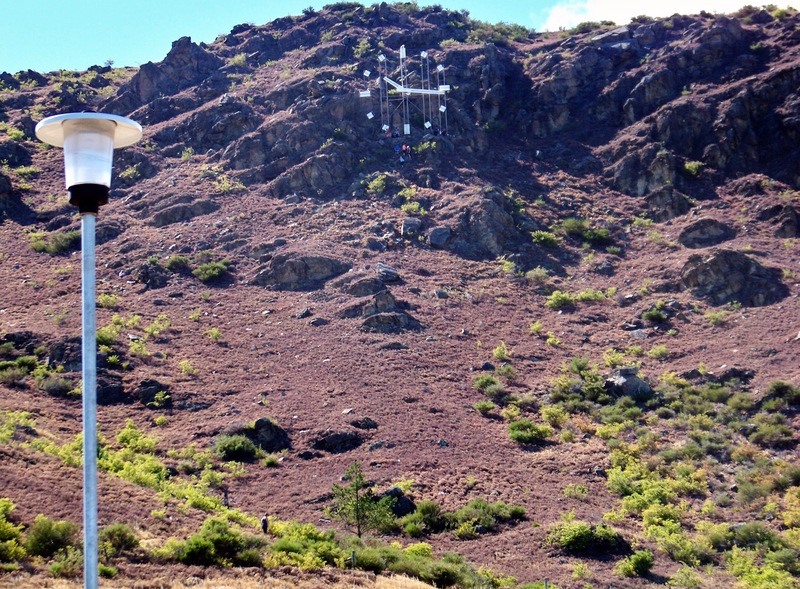 Upon our return to Christchurch, we rang the number we had been given, once we estimated we’d be about an hour away from the airport. As this particular day was a public holiday, this meant we were met at the hotel, upon our arrival. After unloading the vehicle and checking in to drop off our luggage, we followed their car back to the depot, a very short drive away. The final check was completed, vehicle handed over, and we were delivered back to the hotel, in less than half an hour after leaving. A smaller company with simple, uncomplicated, personalised service. Very different to the big companies. I would highly recommend giving this company a try. Why not treat yourself to a bit of older luxury at a similar price to a newer car. Keep the Queenstown pick/up drop off in mind, it could be very handy if you’re heading to this activity and scenic filled part of NZ. You too could be driving around in a little Mercedes convertible, for a similar price to an ordinary small car. Enjoy the scenery…. So much to catch you up on! Welcome all to 2015. 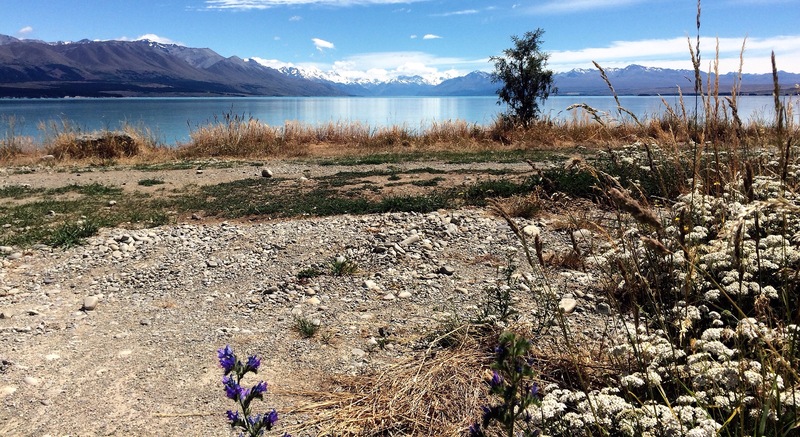 We used the holiday break for a road trip through the lower half of NZ’s South Island. During the next couple of weeks I will catch you up with some awesome places to visit plus review Air New Zealand and the Koru Lounges we used, as well as the rental car company Drive Something Nice, amongst other businesses. This is merely a brief overview of our trip in the interim, to give you an insight into some of the spectacular areas we saw during our road trip. Our arrival into Christchurch at midnight, had us staying at the airport hotel Sudima. We picked up the hire car in the morning and drove through to a Invercargill. For us a short 7-8 hour drive, compared to some of the drives we undertake in Australia. There are towns all along the coast road, including the majors, Ashburton, Timaru, Oamaru, Dunedin plus many smaller townships along the way. Each has their own attractions and places to stop. Choose towns or beaches for your stops along the way. New Zealand is different to Australia when it comes to a road trip. Firstly the distances are shorter, which did horrify many of the locals that we would undertake what they considered to be long trips in one day. Secondly, we found a lack of facilities roadside, ie toilets etc. There are rest areas but these are not set up like the Australian ones, which are regularly spaced and complete with facilities. I would therefore recommend stopping in townships for food and toilet breaks. At the end of the day though, the scenery is most likely one of the main reasons you are here. The scenery throughout NZ is without doubt, nothing short of spectacular. Canterbury Plains out of Christchurch, heading south, have long straights punctuated with tall hedges to break the winds. After a few short stops, we chose to stop at the iconic Moeraki Boulders for lunch. 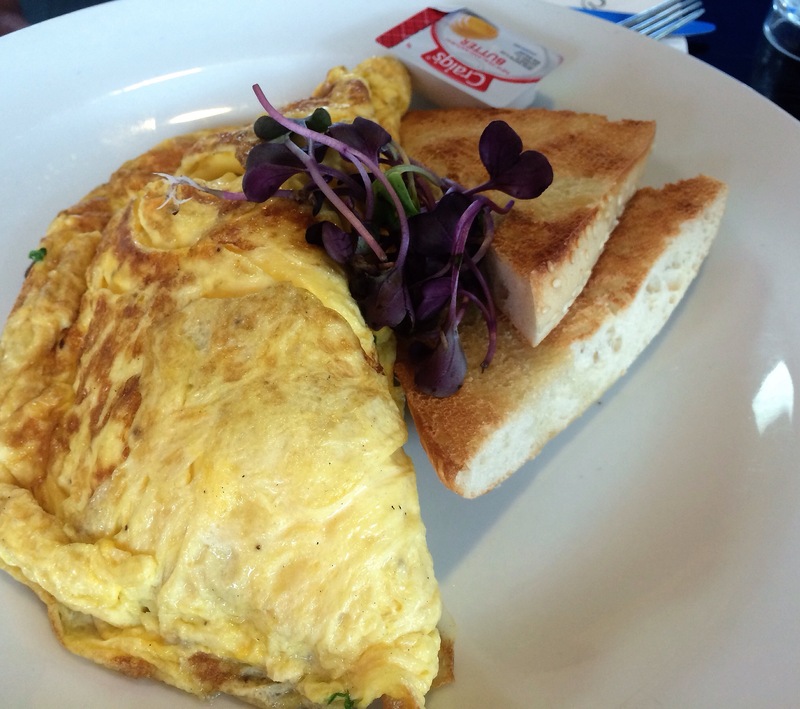 A review of the cafe and the boulders has been completed already. This is definitely a place to visit. There are many places to explore, sometimes just off the beaten track. Watch out for the road signs, check your maps before you go and be sure to take breaks along the way. 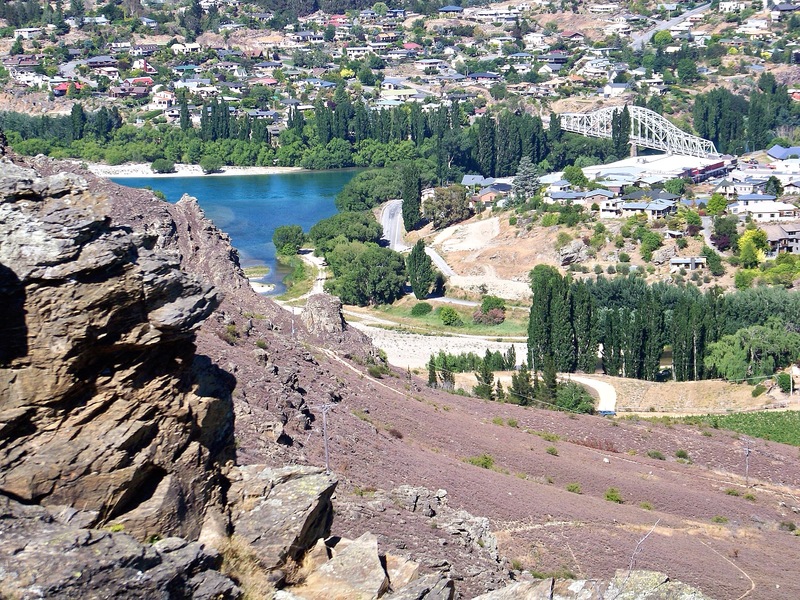 After some time in Invercargill, we drove through to Alexandra, Central Otago, via Gore. Here, the rolling green pastures, change to steep rocky mountains, with pastures drying out along the way. Rivers are clear, sparkling, and even in December, snow still lingered on some of the higher mountains. The photo above was taken from the lookout above Alexandra. Even from this height, you can see the clarity of the water in the Clutha river. There are many places you can go from here, explore Central Otago, head through to the West or East Coasts, or, travel through to Wanaka or Queenstown. On this occasion we were travelling to Queenstown. The photo above was taken of Lake Wakatipu as we drove through to Glenorchy, near the opposite end of the lake to Queenstown. Here the scenery is breathtaking. 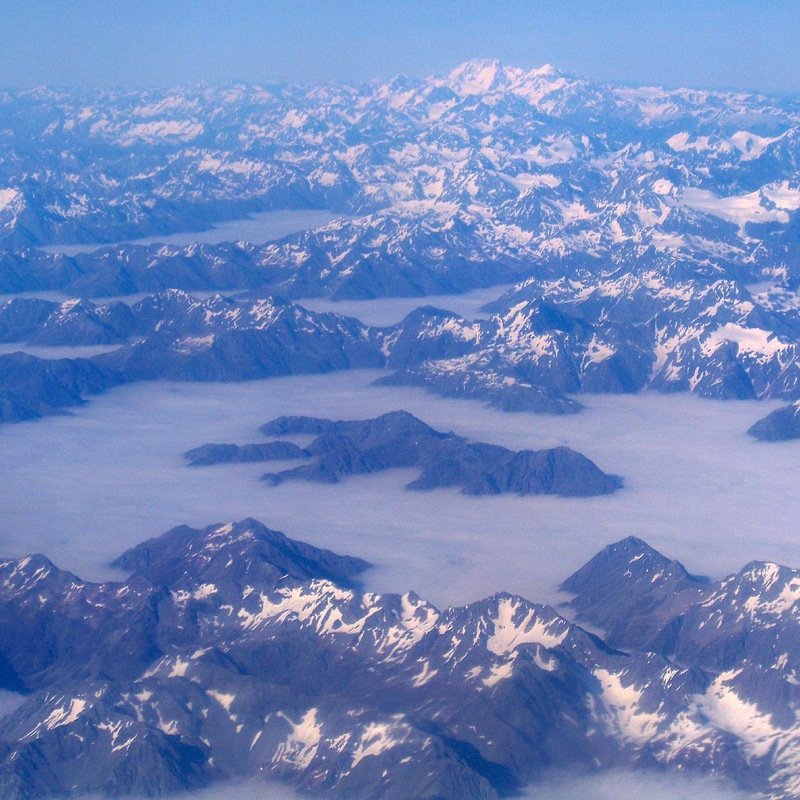 These mountains are not called the Remarkable’s without reason. They are truly remarkable. After leaving Queenstown, we drove through to Christchurch via the lakes district and the Lindis Pass. 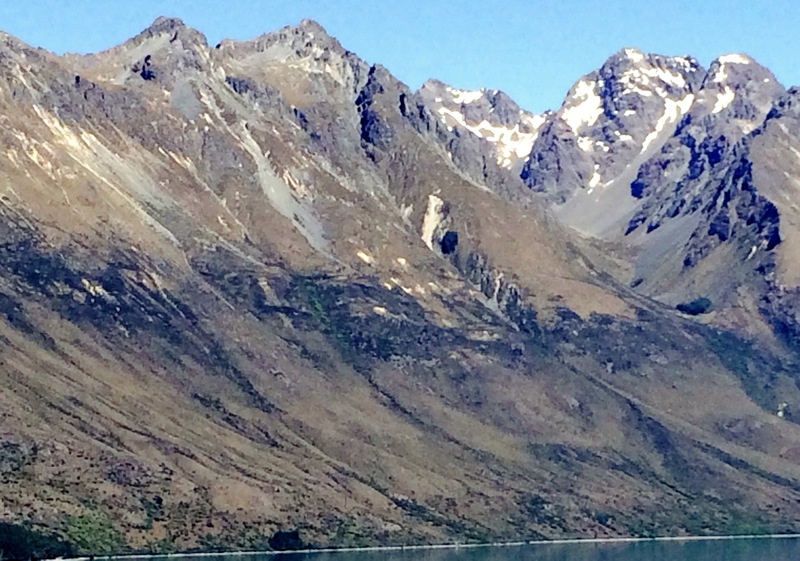 This took us past the Mount Cook, Aoraki area. Here, on another spectacular day, I was able to take the below shot of Lake Pukaki with Mount Cook in the background. You never know in these areas, the expectation of seeing hobbits and orcs traversing the mountain ranges is high 😄. Take care when travelling the NZ roads, remember to drive on the left, and stay inside your lane. Roads can be narrow and twisting at times. Obey speed signs on the highway, through townships and particularly on corners. If it says 65, then do not go over this speed for that corner. They have have those speeds there for a reason. Drive safe, take care so everyone can return home safely. Watch out over the next few weeks for reviews and photos of the many areas we visited. There’s plenty to come! !